Tyus Battle dribbles up the court in the first half. Mandatory Photo Credit: Kicia Sears, The Juice Online. WHAT HAPPENED: After Dejan Vasiljevic’s 3-pointer with 16:30 in the second half cut Syracuse’s lead to 38-37, the Orange went on a 14-4 run. By the time Tyus Battle made a pair of free throws after the Miami bench was called for a technical foul after arguing a blocked shot, SU had already taken a 52-41 lead. Syracuse would open up a 69-48 lead after Elijah Hughes’ jumper, and the rout was on from there in a rare blowout win for SU in conference play. 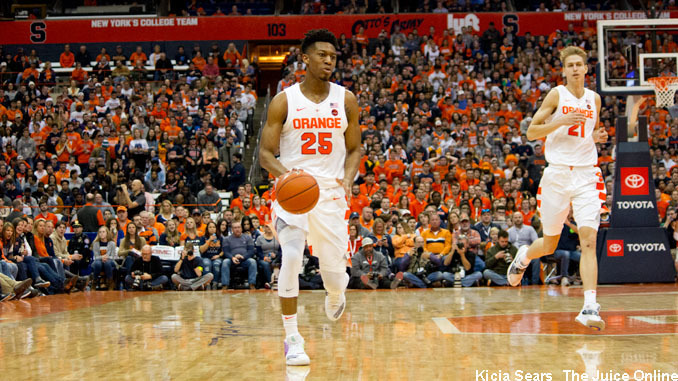 ANALYSIS: Syracuse’s offense, which looked vexed and timid for much of non-conference play, has come alive recently. The Orange had another outstanding offensive showing, shooting 50 percent from the field, 14-30 from downtown, and a season high 22 assists. Five different Orange players hit a 3-pointer, led by Hughes’ 6. Defensively, Syracuse swarmed Miami after a slow start, blocking 11 shots (the Hurricanes, by contrast, had zero blocks). The only saving grace for the Hurricanes was their rebounding edge. They were +12 on the boards, including 15 offensive rebounds, many of them coming off long misses from beyond the arc. HERO: Tyus Battle didn’t have a great shooting night, scoring just 10 points on 3-8 shooting and 1-5 from downtown. But he stuffed the stat sheet in every other way, dishing out a team-high nine assists to go with five rebounds. Perhaps even more impressive, he had zero turnovers. Hughes led all scorers with 22, while Buddy Boeheim had another torrid shooting night, finishing with 12 points and three 3-pointers. ZERO: With Buddy’s hot shooting and Battle’s steady hand at point guard, Jalen Carey has been the odd man out. Carey didn’t play at all against Pitt, and only got in during garbage time against Miami. WHAT’S NEXT: Syracuse has an opportunity to notch a resume win, traveling to play No. 10 Virginia Tech on Jan. 26 at 8 p.m. TV: ESPN.